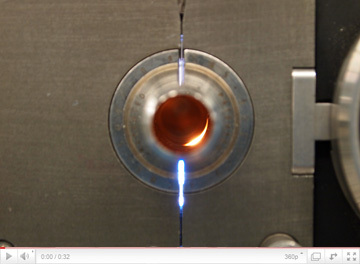 We're setting up new deposition systems in our lab so I had to do some welding using a Swagelok orbital tube welder. This time I had to weld 1/2 inch OD tubing which was cool because you can look into the electropolished cylinder and watch the welding process as the welding tip orbits around the tube. You can see white/blue light from the welding arc between tip and tube. This page contains a single entry by Franz Koeck published on March 12, 2011 7:00 PM. What a sky... was the previous entry in this blog. Fresh green looks. is the next entry in this blog.